Mr. Salvini, the leader of the anti-migrant League party and the country’s tough interior minister, had arrived to leave a rose at the entrance of a drug den where the police had discovered the body of a 16-year-old girl, Desirée Mariottini, who they believe had been repeatedly raped, perhaps while unconscious, and left for dead by African migrants. But the activists in San Lorenzo, a traditionally left-wing neighborhood still scarred from the bombings of the Second World War and now bearing the fresh wounds of drug dealers and lawlessness, refused to let Mr. Salvini pass. They carried banners reading: “Salvini exploits tragedies. San Lorenzo is not your campaign’s catwalk,” and shouted for him to leave. The standoff this past week laid bare Italy’s widening polarization. But if Mr. Salvini’s opponents on the left are now attuned to his media tactics and use of the migration issue to whip up his supporters, they have yet to blunt his deepening political inroads, outside this Roman neighborhood at least. Mr. Salvini’s march has only continued. The leader of the formerly separatist party (it used to be called the Northern League) has used a new nationalist “Italians First” message to eclipse his governing partners in the Five Star Movement and become the driving force of Italy’s government. He has cracked down on migrants, raised the alarm about a drug and security emergency, led a rebellion against the European Union, insulted its leaders as drunks, sated the news media with a constant stream of outrageous sound bites, baited the left into overreactions by purposefully echoing Mussolini and filled the widespread Italian demand for a law-and-order heavy. Virginia Raggi, the mayor of Rome with the Five Star Movement, is deeply embattled as the city has fallen into disastrous degradation, with garbage strewn across dark, broken streets and drug use spiking in bleak neighborhoods. She is also facing a sentence in November on charges that she had lied to the local authorities, which she denies. If she were to resign, which is unlikely, elections could be held next May, and Mr. Salvini’s League is in a better position than ever to capture the capital. “A League Mayor in the Capitol,” read an exuberant headline of the conservative newspaper Il Tempo. In the death of Ms. Mariottini, Mr. Salvini, one of the most politically attuned leaders in Europe, heard a clarion call that he has heard before and that has helped propel his political rise. A month before the Italian elections in March that brought him to power, the dismemberment of another troubled Roman teenage girl, Pamela Mastropietro, allegedly by a Nigerian drug dealer, inflamed a nation already fed up with illegal migration. Mr. Salvini helped it along, calling her alleged assailants maggots and proof that migration had gotten out of control. Ms. Mastropietro’s death soon led to a shooting spree against migrants by a right-wing extremist in the small town of Macerata, where she had died, and it prompted a more lasting national uproar that has fed the dramatic rise of the League party and Mr. Salvini. The death of Ms. Mariottini provided a similar opening for Mr. Salvini, who uses social media as a constant and attention-demanding megaphone: He wrote on Twitter Wednesday morning that he had attended an emergency public order meeting with Ms. Raggi. 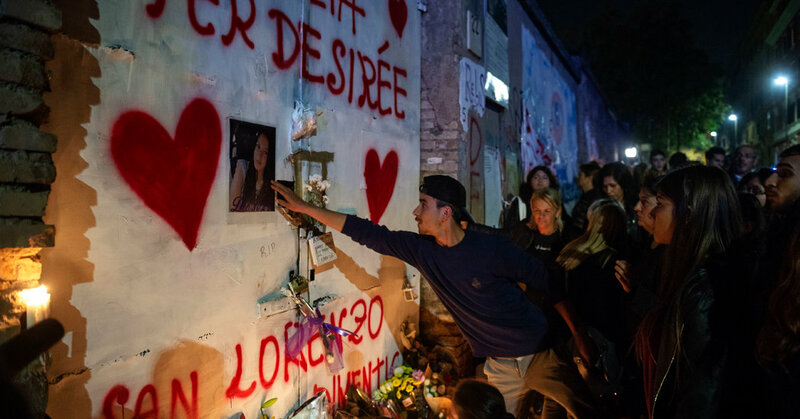 But before he arrived, cameramen, TV anchors and activists crowded in front of Via dei Lucani 22, the entrance to the drug den where the girl had been found and where the words “Justice for Desirée” was now written amid red hearts. The protesters exchanged sharp words with a few of Mr. Salvini’s supporters, who made sure their voices were heard. Suddenly, a stir ran through the crowd. “He’s coming,” one reporter shouted, and the scrum rushed away from Ms. Curti and the protesters to the other end of the street. Moments later, Mr. Salvini, wearing a cobalt blue suit and open-collar white shirt, was encapsulated in the warm cocoon of the press. The former disc jockey immediately began talking. He said he would have gladly left the rose that he had brought with him in the car if it weren’t for “those imbeciles.” He said, “We’re going to hurt the drug dealers.” He said he would act to get rid of an “idiotic law of the left-wing government” that had decriminalized drug use. At a certain point, Mr. Salvini broke free from the scrum and ran up the street, but the protesters, screaming that he should leave the neighborhood, held firm. Mr. Salvini stopped, and the protective orbit of camera satellites surrounded him again. Mr. Salvini’s movable news conference seemed stuck. After more than 20 minutes, he retreated to his car and drove off. “We had had a good result in not allowing him onto the street,” Ms. Troisi, the activist, said triumphantly. But she acknowledged that Mr. Salvini seemed always more popular in the city and the country, and that he always seemed to come out on top. A couple hours after the rally broke up, Mr. Salvini returned unannounced and left a rose in front of the gate.